1876 Owned Albrecht et al, Manitowoc, WI. 1876, Jun Dismasted near North Manitou Island, Lake Michigan. 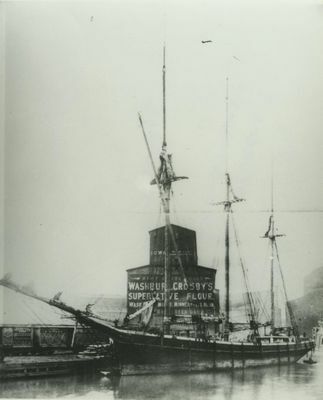 1876, Aug 17 Broke from moorings at shipyard in Milwaukee, put in drydock for further repairs. 1890 Sold to L. S. Sullivan, Toledo, OH. 1893 Dismasted in Lake Michigan storm, blown onto South Fox Island. Coal lightened to release. Towed to Manitowoc, WI for repairs. 1894, May 18 Ashore south of Milwaukee Harbor. 1895, Jul Stranded North Point, Alpena, MI; coal lightened to release. 1899, Jun 3 Damages in storm off Point Pelee, Lake Erie. 1904, Oct 10 Remeasured, 168 x 31 x 12.5; 489 gross tons/460 net tons. 1912 Sold to a Milwaukee Coal Company. 1914 Reduced to coal lighter, renamed TRANSPORT.